Or should that be “Progress Update on my Novel”? I’ve been working since February 2011 on my first novel, currently titled “Reintegration: A Practical Guide for the Working Metanaut (a novel)”. I say “currently” because I am not above being talked out of it by an editor or agent who feels they know better than me what is marketable. For now I am somewhat fond of it, though. Perhaps that’s because the title, like the classic Hitchhiker’s Guide to the Galaxy, comes from the name of a fictional book that plays a role in the plot line, albeit a somewhat small one in this case. The novel itself, to use the one-sentence description I came up with in February, is “an inter-universe coming-of-age story”…and that’s all you need to know for now. In November, soon after completing the rough draft, I started a full read-through/revision of my manuscript (this could be considered by some to be the second revision, since I had already done a revision on each chapter as I finished it. Then again, some people would say that doesn’t count. Whatever). That revision produced innumerable in-line fixes and changes, as well as 368 notes (Word calls them “comments”) which mostly consisted of things like “fix this” (short for “fix this at some point in the future because right now reading it makes me want to lobotomize myself with an egg beater”). As of a few minutes ago, I finished addressing the comments in chapter ten, which means there remain ten more chapters and an epilogue to go. 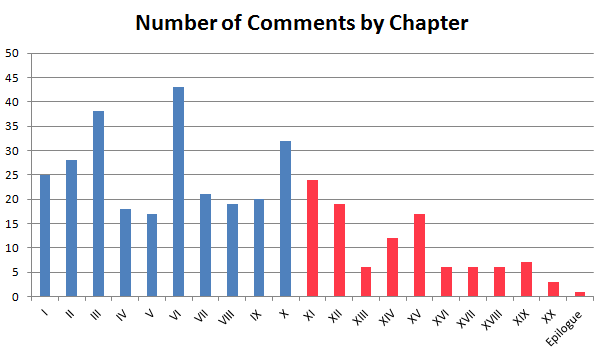 The red bars are chapters I haven’t addressed yet. As you can see, even though I’m chapter-wise around the halfway point, I’m actually about 70% done in terms of number of comments. This is for two reasons: 1) The chapters towards the end of the book tend to be a bit shorter, because some of them are focused on wrapping up the story and that type of narrative doesn’t tend to drag on too long. 2) I wrote the book in linear order, and I got better at writing as I went, so the chapters towards the end didn’t need as much fixing. Once I finish the remaining 100-odd comments, I’ll need to start over again and do another revision, both to review some of the new stuff I’ve written (I added four scenes and substantially changed several others), and to “tighten-up” everything. But before I do any of that, I’m going to take a break of somewhere from two weeks to a month (I mean really, how many times can I read the same novel in a row without going insane?). In the meantime, I’ll continue to work on the short and serial fiction here, especially EPIC FANTASY 0.9b, for which I spent some time this weekend outlining and drawing a map. My plan is for that series to run about 25,000 words total, at which point I will release it as a free eBook novella (and from the looks of what I’ve got in this outline, it’s going to be a pretty awesome one). At least, that’s the best laid plan; you know how those often go. I started at around 90,000 words in the book before this revision started, but due to all the additions it’s ballooned up to over 100k. My hope is that after the tightening-up is over, I will have cut it back down to somewhere around its starting size again, and I’ll have something that’s presentable to beta readers. Anyone want to submit an application? The Hitchhiker’s Guide to the Galaxy is one of my all time favorites (probably like every other F-ing nerd on the Internet). I’m looking forward to seeing more of your book. Thanks! Good luck with your fungus story.